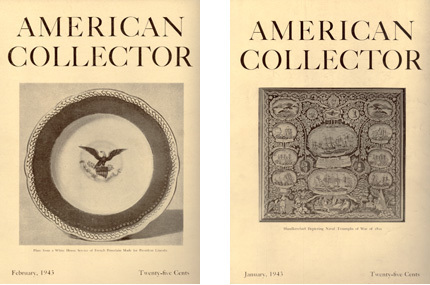 “American Collector” was a beautiful, high-quality magazine published out of New York City in the 1930s and ’40s for people interested in antiques and collecting. Because a great deal of research went into the production of that magazine, which is now in the public domain, we decided to put as many of its articles online as possible as a reference for today’s collectors. The magazine ceased publication in 1948 at the start of the postwar boom, when people were turning to new consumer products and losing interest in antiques. A different, and unrelated, “American Collector” magazine was published briefly in the late 1970s.